I was hired in 2011 by the Orange County Sheriff's office. After serving a week inside the jail I was moved to patrol. During my fourth year with the Office I was promoted to corporal of patrol. 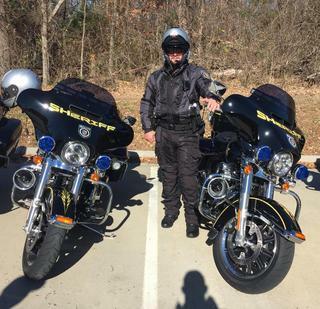 In the early part of 2016 Sheriff Blackwood started the motorcycle program for our office and myself and two other deputies were selected to be the first members of the program. We were sent to NCSHP's motorcycle training where we graduated. Our Motorcycle Unit was introduced to the public in October of 2016. We currently have two motorcycles and are getting our third in the early part of 2017.